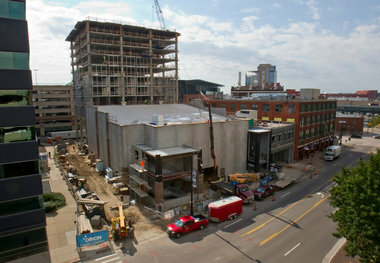 GRAND RAPIDS, MI - Jeff Smigielski smiled as he watched his construction crew working on the dusty and cluttered floor of the performance hall at 20 Monroe Live, the new concert venue that will open in five short weeks. No worries, says Smigielski, project manager for Orion Construction Co., which has had up to 150 construction workers building the concert venue and 11-story apartment tower next door to The B.O.B. night club in downtown Grand Rapids. "I've done this plenty of times. I know what it takes to get the job done," said Smigielski, who will turn over the concert venue by the end of this week to Live Nation, the promotion company that will finish the venue and open with a Feb. 1 performance by Trombone Shorty. 20 Monroe Live will be a 2600 capacity club and is in partnership with The B.O.B. Live Nation will install the stage, wall coverings, lights, audio systems and seats in the performance hall, Smigielski said during a hardhat tour on Tuesday, Dec. 27. When completed, the concert hall will seat up to 2,400 concert-goers on the main floor and in the balconies. The $11.3 million concert hall will include a portable stage that will allow promoters to make the room more intimate for smaller shows. Live Nation and House of Blues are expected to bring about 120 shows to the new venue per year. 20 Monroe Live also will have five bars, a VIP lounge and large lobby that will be located next to an outdoor beer garden. Concert-goers also will be able to enter and leave via a second-floor door to The B.O.B. Despite its address on Monroe Avenue NW, the main entrance to the concert hall will be on Ottawa Avenue, facing West Fulton Street. The doors facing Monroe Avenue open to the back stage and only will be used in non-concert events such as ArtPrize. As part of the same project, Orion also is working towards the completion of the Venue Towers, an 11-story 94-unit apartment complex schedule to open in the spring of 2017. The $15.4 million Venue Tower will have 46 one-bedroom apartments, 22 two-bedroom apartments and 26 "micro-loft" apartments that will offer narrow galley kitchens with smaller appliances and "Murphy beds" that can fold up when the tenant is not sleeping. Venue Towers also will have a large "club room" and space for tenant amenities on the fourth floor. Up to 92 parking spaces will be available for tenants across the street in the city's Ottawa Fulton parking garage. Pre-leasing for the apartments is expected to begin in the spring, according to Jason Wheeler, public relations coordinator for Orion Construction Co. The outdoor beer garden also is expected to be completed in the spring, he said.